Summer 2014: Is the Protest Over? Summary: Has the conflict really ended? Or has the Protestant world merely forgotten what the conflict was about? Has the conflict really ended, or has the Protestant world merely forgotten what the conflict was about? 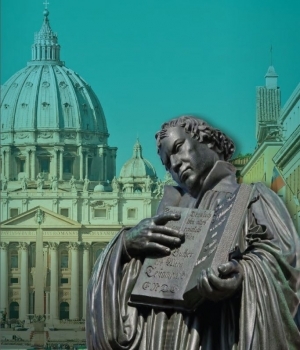 Luther’s initial conflict was not about the doctrine of Justification by faith alone as Bishop Palmer suggests, but rather about the usurpation of papal authority (as he saw it at the time) with regard to the question of indulgences. The conflict over the authority to issue such indulgences became so great that Luther finally came to the conclusion that the papal system was antichrist, as by issuing such indulgences they were trampling on the prerogatives of Christ. The central issue was thus one of authority and this conflict escalated to the point where papal authority was placed in juxtaposition to the authority of Christ. The Reformation came to seek its authority in the Scriptures alone which affirmed to them the centrality of Christ and led to the famous trio of proclamations “Sola Christos”, “Sola Scriptura” and “Sola Fides.” To counteract this ‘rebellion’ against the authority of the pope, the order of the Jesuits was created whose sole purpose was to destroy this movement of defection. At the council of Trent, which was directly under the control of the Jesuits, papal authority was elevated above that of Scripture and ultramontanism (which has come to mean ‘all power in one man’) was entrenched. Tradition was the stated context whereby Scripture, had to be evaluated and, as the Archbishop of Reggio so ‘eloquently’ argued at that council, the Catholic Church could prove its authority over that of Scripture because it had transferred the solemnity of the seventh day Sabbath to Sunday, a move based solely on the authority of the church.v It is on this point that Protestantism missed the golden opportunity to affirm its adherence to Scripture alone, but by accepting this argument without a “word of remonstrance” they effectively capitulated to papal authority and it became only a matter of time before they would give up their protest in its entirety. Sadly it seems that after holding out for nearly five hundred years of pain, war, the rack and the inquisition they have decided to choose the five hundredth year of Protestantism to finally relinquish their position. The doctrine that salvation is to be found in Christ alone has also been severely undermined by the Jesuit architects of Vatican II since Karl Rahner (the chief theologian at that council) effectively opened the door for placing all religious movements on an equal footing in terms of Salvation. His student, Paul Knitter, wrote the book No other Name?vii in which he effectively argues that salvation is no longer ‘through Christ alone’ but can be obtained through any system of religion not even excluding atheism. He is also the author of the book Without Buddha I could not be a Christianviii which is in a sense compulsory reading for those who embrace religious globalism and see religious truth as a hologram which makes the Jesus of “I am the way the truth and the life” just one of many avenues reaching for the divine. The core issue that drove the Reformation was that of authority. Either Christ is supreme or His supposed representative is supreme. There can be no middle road in this equation. Obviously, from the Protestant perspective the conclusions to be reached must be based on doctrine —Biblical doctrine. It is therefore imperative for Rome to introduce tradition as the context in which the Bible must be interpreted in order to authoritatively dispense salvation contrary to Biblical teachings. All papal doctrines stand or fall on this stumbling block, and this stumbling block is Christ. It is no wonder that Tony Palmer suggested that we lay aside doctrines as the basis for unity (“God will sort out the doctrines when we get upstairs” were his words) and that we let the charisma of the Spirit guide us to unity (“glue us together”). 1 Jn 4:1 Beloved, believe not every spirit, but try the spirits whether they are of God: because many false prophets are gone out into the world. The words spoken by the Archbishop of Reggio at the council of Trent regarding the Sabbath issue and its bearing on Sola Scriptura have not been laid to rest over the last five centuries. More than ever this issue has become a test of authority, not only regarding the Sabbath day per say, but regarding the authority of the Scriptures in their entirety. Since Christ, the incarnate Word, is both the Creator and the Redeemer in Scripture, He is thus also the Lawgiver and as such His authority is intricately linked to this conundrum. 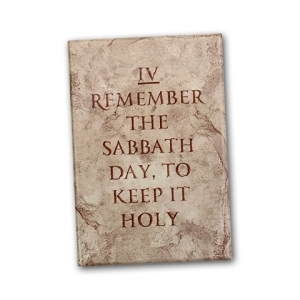 Choosing the Sabbath thus means choosing the authority of the Scriptures, with all its doctrinal implications, over that of papal tradition and in a real sense this means choosing Protestantism over capitulation. Perhaps, Protestantism and the world will be faced once again with an antitypical ‘Bishop of Reggio’ challenge and by God’s grace they will hopefully choose differently this time. i. "Bishop Tony Palmer and Pope Francis - The Miracle of Unity has Begun: KCM Minister's Conference 2014"
iv. "Lutherans and Catholics bury the hatchet for Reformation’s 500th"
xi. John 14:6; John 17:17; Ps. 119:151; 1 John 2:4.